These students are among the seniors who took part in the Citizenship and Social Justice class this fall that taught the students about King County's budget. 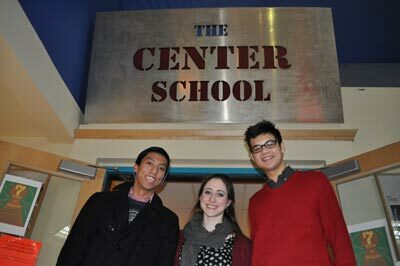 From left is Enrico Hipolito, Megan Kennedy and Matthew Wolf. When teacher Jon Greenberg started working with his Center School seniors in his Citizenship and Social Justice class this fall, the students didn’t realize they were going to learn some hard lessons about the real world. Greenberg’s aim is to immerse his 52 advanced placement senior students into issues that confront local government agencies. “I want this class to be a situation where they don’t just read about the government, but they actually get involved with government issues,” said Greenberg, who has taught at the school since it opened in 2001. This year, Greenberg focused on King County and asked his students to think about how the King County Council should respond to Executive Dow Constantine’s proposed budget released earlier this fall. The budget called for cuts in social and human services supported by the county. To answer this question, Greenberg had the students visit various human service organizations, including the Eastside Domestic Violence Program and the Aloha Inn Transitional Housing center on Aurora Avenue. They talked with officials at these centers about the services they provide and how their organization works. The students also met with people who had been homeless and who now sell the “Real Change” newspaper in Seattle. The next step was to immerse the students in the nuts and bolts of the budget process. Greenberg brought in guest speakers to talk about the budget from various different perspectives, including a King County government representative and those from certain social services groups. Members of the Real Change Homeless Speakers’ Bureau also gave the students a first-hand description of what it is like to be homeless. John Drescher, the executive director of TechNet, also spoke to the students, offering a more conservative perspective on the need to control government spending. In this case, the students decided that King County needed to find ways to continue supporting social programs. One solution they offered was reducing the amount of money the County spends on Justice and Safety, which currently accounts for about 76 percent of the $648.1 million in available spending. At the same time, the Health and Human Services Program has shrunk to only about 4 percent of the current budget. To advocate their position, the seniors took on different tasks. Some wrote guest columns to this and other newspapers. The top column is printed on page 5 of this edition. Others stood on street corners in downtown Seattle asking voters to sign post cards that stated their position that more money should go to health and human services. Still others made public service announcements. A final group volunteered to speak to a meeting of the King County Council. While all students were required to attend a council meeting not all had to give testimony, but Greenberg was surprised at the number of students who signed up to speak in front of the elected officials. Greenberg was impressed by the powerful speeches given. For many of the students, the most powerful part of the program, so far, was talking with homeless people. Queen Anne resident Matthew Wolf said this class has opened his eyes to the plight of the homeless. As for getting involved with the governmental process, the students said that learning a little about how King County works and how to contact lawmakers helped them realize that their voices could be heard. Greenberg said making the government accessible is part of what his class is all about.